As I discussed in this essay last year, the levels of dopamine at D2 receptors may mediate parts of the u-shaped response curve to psycho stimulants. One of the key pieces of evidence for this is that suboptimal baseline activity at D2 receptors in certain brain regions is related to more impulsive responding. 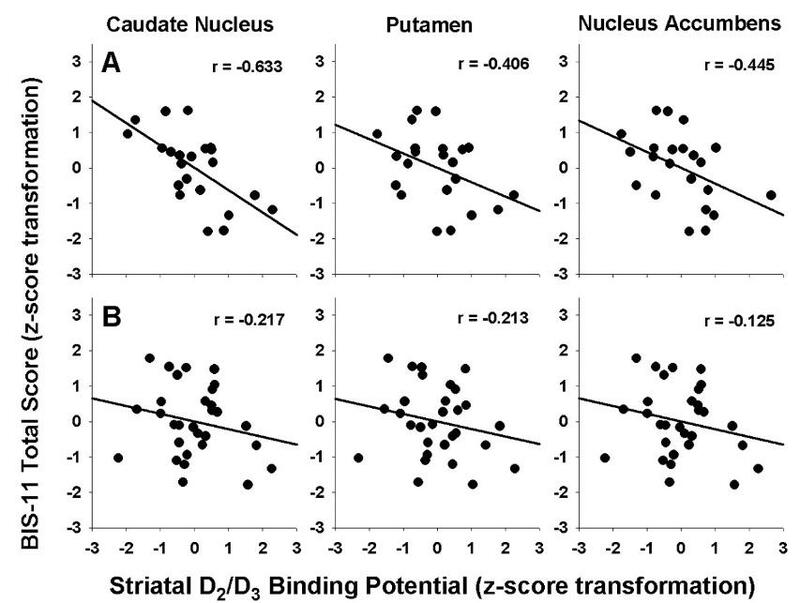 One interesting twist could be to directly test for impulsivity via an individual’s propensity to discount delays in reward and correlate that with striatal D2-receptor like dopamine availability. As Amy Odom (here) discussed today at SQAB, the correlation between self-report and delay discounting isn’t always all that strong. Lee B et al, 2009. Striatal Dopamine D2/D3 Receptor Availability Is Reduced in Methamphetamine Dependence and Is Linked to Impulsivity. Link here. A negative sign indicates that the drugs downregulated activity in the region and a plus sign indicates that the drug upregulated activity in that region, in so far as BOLD contrasts indicated changes in neuron activity. These procedures compared the effects of these drugs on healthy adult rats to the effects of saline solution. One consistent positive region of effect is the nucleus accumbens, a dopaminergic nerve terminal area (see its high levels of DAT) which is often implicated in the deficits found in ADHD. The most persistent negative BOLD effect occured in the caudate putamen. Methylphenidate is known to block dopamine transporters due to its high binding affinity, and usual doses usually competitively occupy ~ 50% of the transporters. This likely leads to a down-tuning of post-synapse dopamine-related neuronal events in regions like the caudate putamen. The search for the mechanism of ADHD drugs, the most commonly prescribed and most highly abused psychostimulants, continues. Easton N, et al. 2009 Mapping the central effects of methylphenidate in the rat using pharmacological MRI BOLD contrast. Neuropharmacology, Article in Press. doi:10.1016/j.neuropharm.2009.08.018. The serum form of amyloid P component (SAP) is believed to bind to neurofibrillary tangles and amyloid deposits in the cerebrovascular fluid. Since beta amyloids are the main constituents of plaque in Alzheimer’s patients and SAP stabilizes them and promotes their persistence, inhibiting SAP may be an indirect method to prevention or restoration in Alzheimer’s disease. Kolstoe et al recently discussed their novel drug, (R)-1-[6-[(R)-2-carboxy-pyrrolidin-1-yl]-6-oxo-hexanoyl]pyrrolidine-2-carboxylic acid (CPHPC), which is small but which can still act as a ligand for SAP by competitively inhibit its binding to beta amyloids. In their pilot study 5 patients with risk factors for Alzheimer’s disease aged 53-67, SAP concentration fell from 32.4 +/- 8.4 mg/L to only 0.25 +/- 0.16 mg/L after one week of drug administration. It remained there for as long as the drug was administered but the SAP concentration returned to baseline once CPHPC administration ended. Since there have been no deleterious side effects demonstrated over a two year period of CPHPC in a separate study, this is a fascinating drug with some real clinical potential. One of the reason for the effectiveness of AIDS drugs has been that doctors can administer a cocktail of drugs, each which target a different aspect of the virus’s propagation. Perhaps a similar approach would be effective in Alzheimer’s, in which case CPHPC could play a prominent role. Of course more trials will be necessary to test these speculations. Kolstoe SE, et al. 2009 Molecular dissection of Alzheimer’s disease neuropathology by depletion of serum amyloid P component. PNAS 106: 7619-7623. doi: 10.1073/pnas.0902640106. How do omega 3 fatty acids promote mental health? Brain tissue is made up of relatively high percentage of lipids (60%), and much of that is polyunsaturated fatty acids. Omega-3’s docosahexaenoic acid (DHA) and eicosapentaenoic acid (EPA) are found in their largest concentrations in the brain, and have been implicated in many neuronal processes such as myelination, neurotransmission, and ion channel regulation. On the behavioral side, many of their somewhat contreversial benefits come in the reduction in onset and/or treatment of symptoms in bipolar disorder, depression, schizophrenia, and Alzheimer’s disease. Psychiatric illness undoubtedly has multiple neural correlates, but one that has been proposed is impaired cerebral blood flow. Sinn and Howe propose that fish oil’s beneficial effects arise because they act as signaling hormones to reduce the chemical synthesis of some vasoconstricting eicosanoid lipid mediators and promote the synthesis of certain vasodilating eicosanoids. This would improve endothelial function, which is associated with the selectively permeability of the blood brain barrier and perfusion in the brain generally. It might also allow for a more optimal allocation of oxygen, glucose, and nutrients. This makes sense from an evolutionary perspective, because if humans originally adapted to a diet with more polyunsaturated fatty acids (i.e., see the aquatic ape hypothesis), then our baseline levels of performance may make our brains uniquely suited to using omega 3’s. Cerebral blood fluid levels can be measured using fMRI, and the authors suggest that further research could attempt to validate their hypothesis by measuring these levels before and after individuals are treated with fish oil pills. Sinn N, Howe PR. 2008 Mental health benefits of omega-3 fatty acids may be mediated by improvements in cerebral vascular function. Bioscience Hypotheses 1:103-108. There is evidence from animal studies that a memory is not permament but instead is changed and returns to a labile, “supposedly protein synthesis–dependent state,” whenever it is drawn from long-term memory and activated. This process raises the possibility that a beta-adrenegic receptor antagonist such as propranolol could disrupt the reconsolidation of the fear memory and thus eliminate it. Using a fear-conditioning procedure, Kindt et al recently tested the evidence that propranolol can affect behavioral fear responses after reactivation in humans. They measured the potentation of the eyeblink startle reflex to a loud noise as compared to the reflex to a control stimulus in each subject. The difference in these measures was operationally defined as the level of fear in each subject. The researchers divided their subjects into two groups (n=20 for each), one of which was given the drug and one of which was given placebo. They ran them on identical procedures, noting that after the acquisition phase both of the groups showed differential responding with more eyeblink startle directed towards the fear-conditioned stimulus. However, when the extinction trials started 48 hours after the drug was administered, the propanolol group was found to have significantly lower responding to the fear-conditioned stimulus (F(19)=25.47, P<0.001, eta^2 = 0.57), while the placebo group did not (F(19)<1). This suggests that when the memory is reactivated the drug prevents it from being reconsolidated. Using a separate experimental group (n=20), the researchers determined that reactivation of the memory is necessary for the behavioral fear response to be reduced by the drug, suggesting that reconsolidation blocking is the primary mechanism at play. Hake et al visited tribes near the Malaysian rain forest and selected 50 medicinal plants in coordination with the Universiti Kebangsaan Malaysia. They conducted cellular assays on each of these and chose the plant Knema laurina as having the most anti-inflammatory potential as well as the least neurotoxity for further analysis. The results were pretty astounding. No neurotoxic effects were found in hippocampal cell cultures, although there was some glia damage at very high concentrations. In hippocampal slice cultures, it reduced the neuron damage from excitotoxicity dose-dependently. At 30 µg/ml and 75 µg/ml, the neuron damage was reduced to levels near the controls. In addition, the plant was found to stimulate neurogenesis after oxygen-glucose deprivation. In vehicle treated brain tissue, higher concentrations of extract from the plant led to a 1.8 +/- 0.2 increase in BrdU/DXC-positive cells, which are both indicators of proliferating cells. The authors claim that this is similar to the neurogenic effects of other pharmaceutical agents, without the neurotoxic side effects. It is cool to see modern science piggybacking on ancient wisdom. Hake I, Schonenberger S, Neumann J, Franke K, Paulsen-Merker K, Reymann K, Ismail G, bin Din L, Said IM, Latiff A, Wessjohann L, Zipp J, Ullrich O. 2009 Neuroprotection and enhanced neurogenesis by extract from the tropical plant Knema laurina after inflammatory damage in living brain tissue. Journal of Neuroimmunology 206:91-99. doi:10.1016/j.jneuroim.2008.10.007.